Cripes, that’s a lot of gifts that need to be wrapped. Then again, I guess it’s better than trying to do it himself. By a small, tiny margin. I dunno, as poorly wrapped he can get the girft done, I still think it’s better that standing in that line. That bottom panel is AMAZING!! Great job, Mario…you don’t stop making my jaw drop! 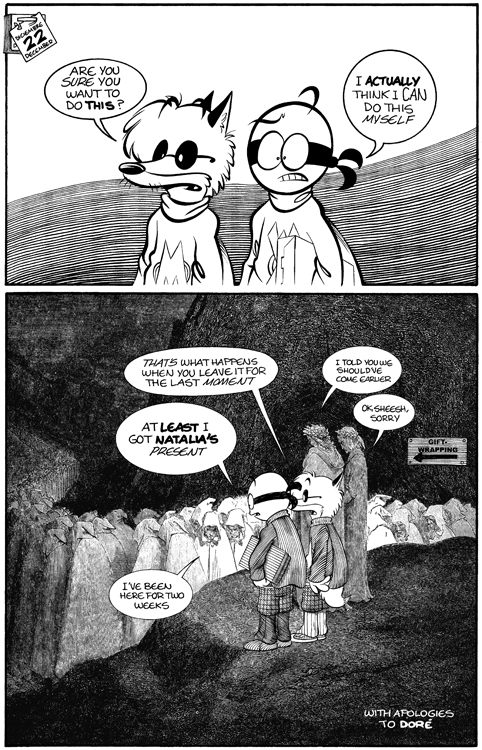 Hahaha, no, I didn’t do that last panel, just the word balloons and Wyliman & Mackenn. I took the picture from the Divine Comedy and placed it there. I’m not that sick yet to get into that much detail (or draw that good). I don’t really doubt myself that I can acomplish that, but it ain’t the day yet that I’m THAT patient to pull it off, heheh. The slow path to Purgatory begins at the gift wrapping line….which I’ve always found so stupid…why take so much time to wrap something when most people will break the paper anyway?